Henry and I have made a car with our hummingbird. It would sense if there were anything in front of it and turn at a 90 degree angle. Then it would go foward again and restart the expression. Here is a video of our car in action. We used card board for the base of the car, and attached the board onto that. 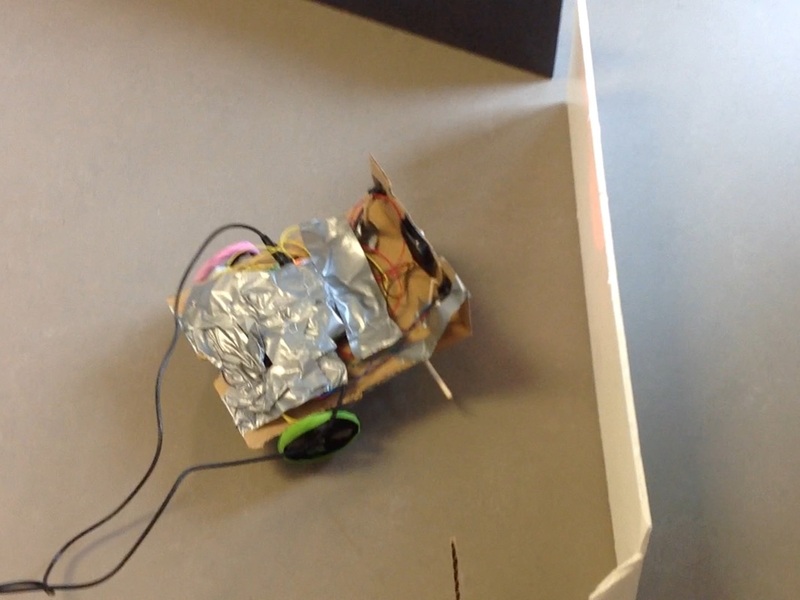 We had lights, a distance sensor, and 2 motors. Then we used chopsticks as the axes for the front wheels. We would have a longer cord from the computer next time, because it would not be long enough and make the car fall. I want to do many small projects for a start. Some of these may include lazer cutting 3D printing and a lot more. I really think that I have learned what i need for 3D printing, but just not lazer printing. I pretty much have what materials I need. This week in creators studio, we made tags. This tag could be put on anything from a suitcase to a backpack. I have not finished, and that's why I have no picture. I also couldn't do it at mY house bc my computers don't have chrome. I used 3D printing To make thIs. It is made of Geometric shapes and holes and let ters. It was very difficult to make.